It’s a sad week for many bunny fans as news of Annie’s acquisition by General Mills makes waves. According to an Annie’s press release, General Mills has swooped in and bought up the self-proclaimed “natural and organic food company” for $46.00 per share in cash, for a total transaction value of approximately $820 million. In a statement, John Foraker, Chief Executive Officer of Annie’s, notes, “We are excited about this strategic combination, which will enable Annie’s to expand the reach and breadth of our high quality, great tasting organic and natural products, provide new opportunities for our employees, realize greater efficiencies in our operations, and maximize value for our stockholders.” Foraker claims Annie’s products will fundamentally stay the same and that the company’s values won’t be compromised saying, “Annie’s will remain dedicated to our mission: to cultivate a healthier and happier world by spreading goodness through nourishing foods, honest words and conduct that is considerate and forever kind to the planet. Authentic roots, great tasting products, high quality organic and natural ingredients, and sustainable business practices will continue to be the cornerstones of the Annie’s brand.” However, if Annie’s Facebook page is any indication, many consumers are skeptical, and in some ways they have a right to be. While both Annie’s and General Mills carry 100% certified organic products, they’re not on the same page regarding GMOs. Annie’s has been a stout supporter of GMO labeling initiative prop 37 in California while General Mills supports Monsanto and gave about $1,135,300 (as of 2012) to the anti-GMO-labeling propaganda in California alone. Still, if you’re a consumer who is bummed about Annie’s selling out, what can you do? If you’re not happy with Annie’s decision to sell, it’s understandable, but if you’re mainly concerned that Annie’s products will remain organic and GMO-free, you may be in the clear as General Mills has experience being a parent company to certified organic and non-GMO sub-companies, such as Cascadian Farm, Muir Glen, and Larabar. Thus far no one, not Annie’s or General Mills, has stated that the basic formula or ingredients for Annie’s products will change. However, the bulk of consumers have noted on Annie’s Facebook page that they’ll be banning Annie’s because they refuse to fund a Monsanto supportive company, but those plans may be semi-futile. These days it’s almost impossible to find independently owned organic, GMO-free companies that don’t also fund Monsanto. As of right now, there are only about 14 independently owned organic companies in America while most of the organic and GMO-free food in the U.S. is owned by larger companies who support Monsanto in one way or another. And what of Annie’s products? Are there any real replacements right now? As a mom friend of mine pointed out, “What’s my other option at this point? Kraft? Making my own macaroni and cheese from scratch every time?” She’s not wrong. You could go with Amy’s mac n cheese, but at $3-$4 a pop, per serving, your quick meal just got super expensive for a family of four. Plus Amy’s, while GMO-free is not 100% organic. 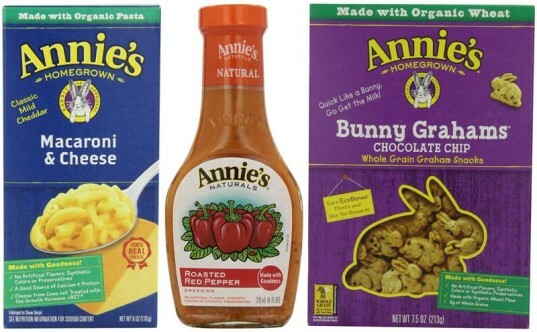 Annie’s makes many other kid-friendly and quick products too, such as fruit snacks, salad dressings, and the infamous cheddar bunny crackers, one of the few alternatives to GMO-packed, non-organic Goldfish. If you’re going to make all of these foods from scratch it’s going to be tough going. Imagine hunting down all the 100% certified organic, non-GMO, non-Monsanto-owned ingredients needed to make organic cheddar crackers every other day, fruit snacks and yes, mac n cheese. Cornucopia notes that consumers who want to make a difference, “Would do well to seek out products from independent organic firms,” but with just 15 or so of these firms in business, good luck. The best you can do right now to avoid Monsanto is to ALWAYS buy 100% certified organic food, attempt to support smaller, organic family farms (check your local Farmers’ Markets), grow more of your own food, buy GMO-free when possible and eat primarily whole food products, not packaged foods. If you want the convenience of packaged mac n cheese, crackers and fruit snacks, Annie’s still may be one of the few choices you have left, so you may want to focus on encouraging General Mills to keep the ingredients consistent. RELATED | Would You Support a Company Whose Ideals Clash With Your Own? It's a sad week for many bunny fans as news of Annie's acquisition by General Mills makes waves. According to an Annie's press release, General Mills has swooped in and bought up the self-proclaimed "natural and organic food company" for $46.00 per share in cash, for a total transaction value of approximately $820 million. In a statement, John Foraker, Chief Executive Officer of Annie's, notes, "We are excited about this strategic combination, which will enable Annie's to expand the reach and breadth of our high quality, great tasting organic and natural products, provide new opportunities for our employees, realize greater efficiencies in our operations, and maximize value for our stockholders." Foraker claims Annie's products will fundamentally stay the same and that the company's values won't be compromised saying, "Annie's will remain dedicated to our mission: to cultivate a healthier and happier world by spreading goodness through nourishing foods, honest words and conduct that is considerate and forever kind to the planet. Authentic roots, great tasting products, high quality organic and natural ingredients, and sustainable business practices will continue to be the cornerstones of the Annie's brand." However, if Annie's Facebook page is any indication, many consumers are skeptical, and in some ways they have a right to be. While both Annie's and General Mills carry 100% certified organic products, they're not on the same page regarding GMOs. Annie's has been a stout supporter of GMO labeling initiative prop 37 in California while General Mills supports Monsanto and gave about $1,135,300 (as of 2012) to the anti-GMO-labeling propaganda in California alone. Still, if you're�a consumer who is�bummed about Annie's selling out, what�can you do?